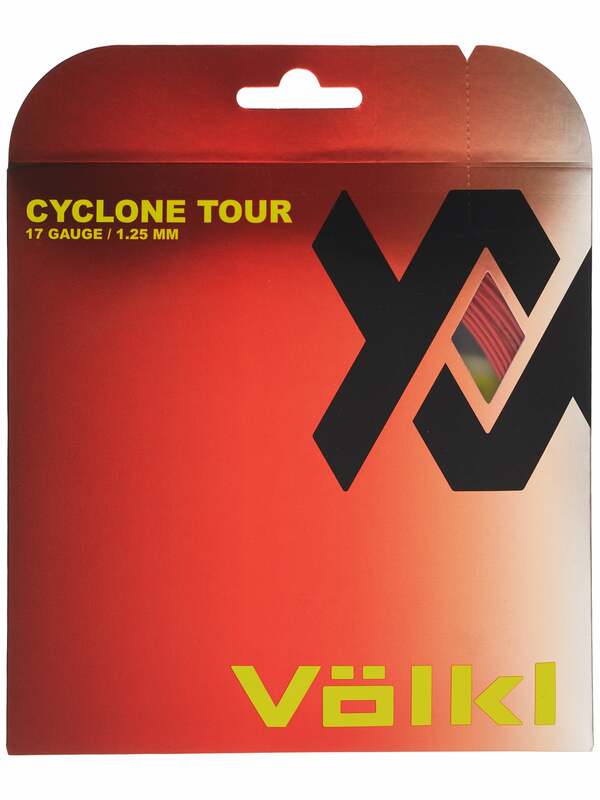 The Volkl Cyclone Tour is the newest addition to the popular Volkl polyester tennis string family. This Tour version is the softer twisted cousin of the original Volkl Cyclone (the black, gear shaped poly string – you can read my review here). I enjoyed the first version and was pretty thrilled to try out a softer version of the same string with a twist! Stringing up the Volkl Cyclone Tour was kind of a pain. I decided to go with a tension of 48 pounds, a little tighter than normal to combat the claims of this string being a powerhouse. The string out of the package held it’s coil more than other polyesters tennis strings I’ve installed. I ran into a few kinks here and there but the biggest problem was weaving the crosses. The textured string was rough when weaving through, I had to be extra delicate to not damage the strings. My knots were clean and ended up with a pretty sharp looking stringbed on my Head YouTek IG Radical Pro. When I managed to get out on the tennis courts ( the weather had been crummy out here on the West Coast) I was looking forward to see what was in store for me. The first few balls were nice, the crisp feeling of a new stringjob was nice. On my full speed groundstrokes, at first, felt amazing! The ball would fly off the stringbed with spin and aggressive pace. I was stoked! I could really feel the ball sitting on the stringbed for a longer-than-usual time that produced a ton of zipping spin! The depth of my strokes were deep where I wanted them…near the baseline. I felt confident enough with this setup to go after my strokes. The Volkl Cyclone Tour was soft, a nice characteristic for a polyester. The player with arm trouble would appreciate the soft yet powerful stringbed, though it is a muted power. Even with the low tension (for most people) I was using, I could place my shots pretty well, I was pretty surprised actually. The ability to place my shots with ease is always a good thing. All things were pointing to a very great offering from Volkl, the feel, spin, and power were all well above par for at least the first couple of hours. Generally speaking, when it comes to tennis string, especially polyester strings, I like them even more after the initial hit. By this time, the strings have settled and all is cozy on the stringbed. Unfortunately, the Volkl Cyclone Tour played like a completely different string the second time around. I was confused. All the impressive characteristics of the Volkl Cyclone Tour that I liked has vanished. The spin was mediocre, the power was uncontrollable, the control was gone, and the strings felt horribly mushy. I thought for sure the tennis string fairy had come into my house and swapped out the strings I had in my stick for something else. Everything was different. The biggest difference that I noticed was the trajectory of the ball coming off the stringbed. Even with a great stroke with great contact, the ball would come off the stringbed very low and would land in the net more often than the first few hours of play. I made slight adjustments to counterbalance the low trajectory, though this created more demand from a string that was becoming less playable by the minute. It wasn’t worth it at this point. Event though this Volkl Cyclone Tour was designed to be soft, it became so soft that I began to feel more string vibration coming from the stringbed. I could start to feel the ache of the now dead strings in my arm from the elbow all the way up to the shoulder. This was not good. One other thing I noticed was how quickly the twisted gear shape had worn to a now rounded smooth string. This is typical with shaped tennis strings, though the worn edges smoothed out much quicker than other polys I have tested. As much as I liked the string in the first couple of hours of hitting with it, the long terms playability was practically non-existent. The spin and crisp feeling was pretty legit starting out, I felt like I could swing out knowing that I could generate enough spin to bring the ball down into the tennis court easily. Unfortunately, the strings rounded so fast that the spin began to disappear so hitting with spin became a challenge. I enjoy a soft stringbed, though I think this would be the first time that I would have opted for something a little firmer. The strings felt just too soft for me. To the point of being overly mushy, even more mush as the tension dropped. Don’t get me wrong, the Volkl Cyclone Tour started great! I would absolutely use this string again, though the next time I would have to string significantly higher in tension to make it worth while, say 55 pounds or more. I think there are plenty of tennis players out there that would really enjoy this string for their setup…especially with the $9.00 price point. It’s a tennis string bargain!